One of the many cats who received a Trump-inspired makeover. Cats far and wide are receiving a Donald Trump-inspired makeover thanks to a recent trend on social media, aptly named #TrumpYourCat. The phenomenon, which has its own Instagram page, involves styling your feline's excess fur into a carefully coiffed hairdo that rivals Trump's own iconic look. The resemblance is uncanny, right? Other animals are getting in on the action, too. 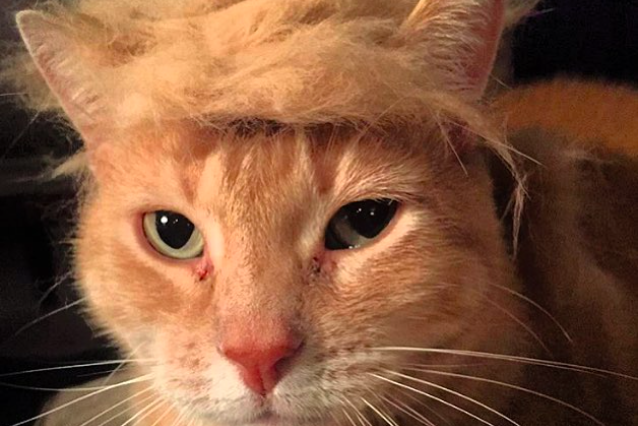 Want to #TrumpYourCat (or any other pet for that matter)? The page provides simple instructions. Form the hair you brushed into a toupee.